Option to gold emboss the recipient’s Name on the front cover, FREE EMBOSSING ON LEATHER BOOK. 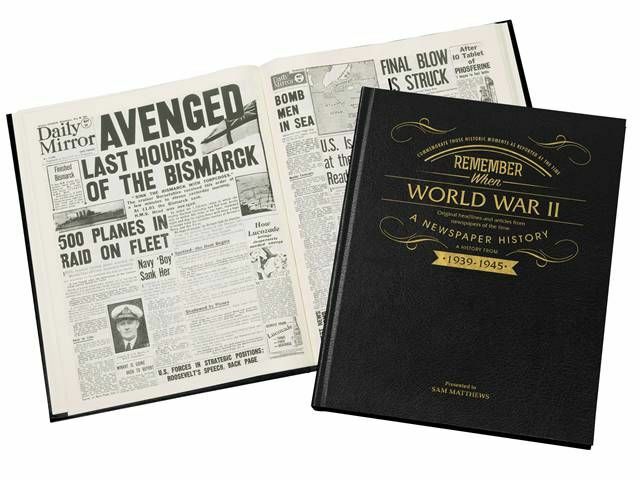 These personalised books on the history of the Second World War are a wonderful gift for those with an interest in World War 2. Read about World War II through newspaper articles written while events were unfolding at the time, and not through the perspective of time. 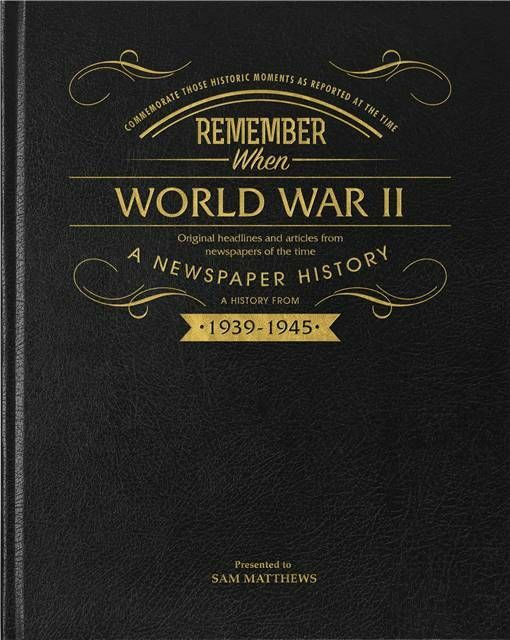 This World War 2 book has been created using scans of the original newspapers published at the time. It is a fascinating insight on the major events during the war as it was fought in Europe and across the World. This World War II book opens on the 2nd September 1939 with the Nazi invasion of Poland. It covers many of the major events of the war in Europe including the rescue at Dunkirk, the D-day landings, the Allied invasion of Italy, the advance into Germany, and finally VE Day. 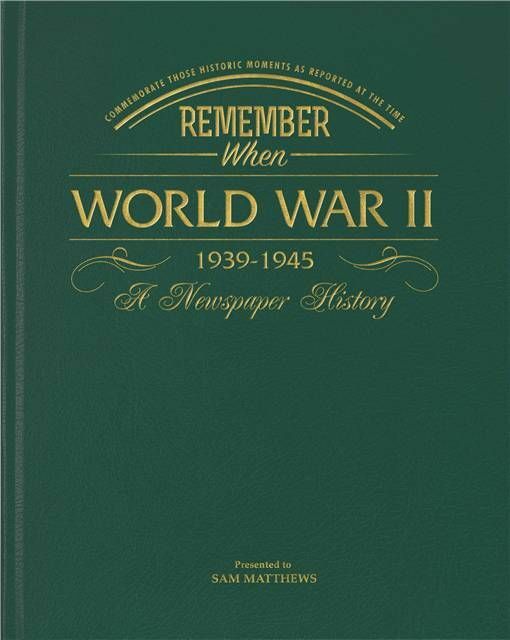 This book on the Second World War also includes newspaper coverage of other major engagements across the world; the North African campaigns, the fall of Hong Kong and Singapore, the fighting in Burma, and the bombing and surrender of Japan. Naval engagements are also featured in this book on World War 2, including the sinking of the Graf Spee, Scharnhorst and the Bismarck, the bombing of Pearl Harbour, and the Sea Battles in both the Atlantic and the Pacific. The book opens with a front page montage surrounding your own personalised label containing the recipient’s Name and a Message. It can be further personalised by gold embossing the recipient’s Name on the front cover. 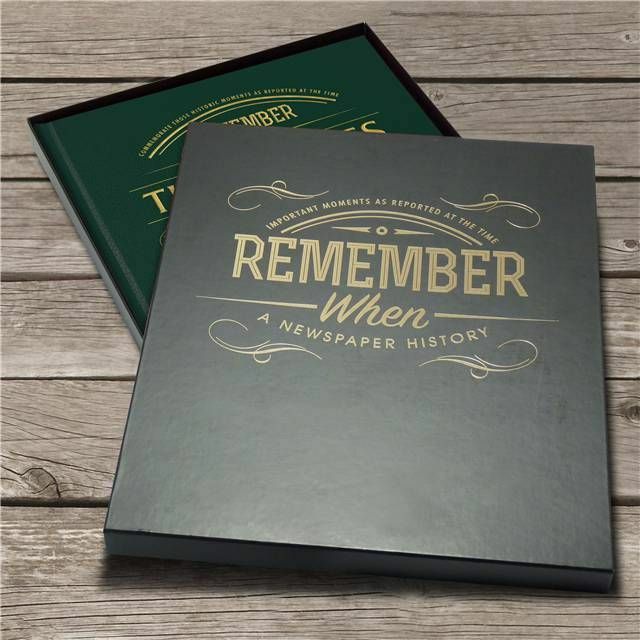 This individually bound hardback book is approximately tabloid size, 38 x 31cm, and is presented in a choice of stylish covers.